Plant Science is one of my favourite topics for HL students as it is a real opportunity to link many of the core ideas of Biology together. Think of not just as a series of assessment statements to check off, but as a chance to revise everything you have learned so far. 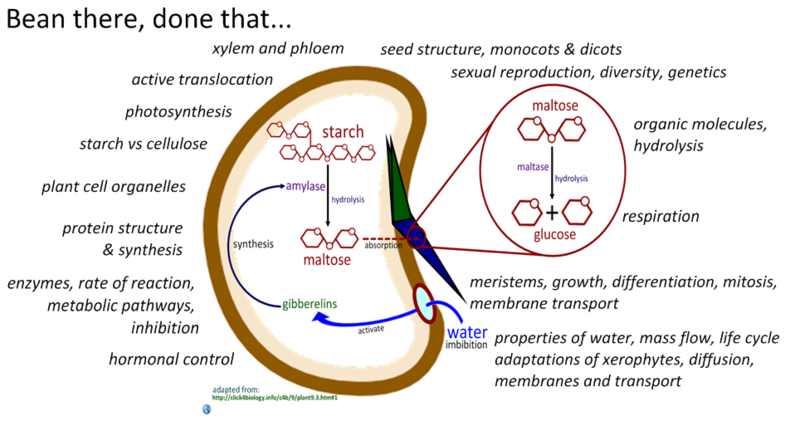 Consider this diagram of germination. How many links across the syllabus can you make? Germination – how many links can you make across the curriculum? Here is the Essential Biology document for the whole topic. Presentations are below. Key terms: monocotyledon, dicotyledon, xylem, phloem, meristem, cambium, leaf, vein vascular bundles, adventitious, tap roots, waxy cuticle, palisade layer, spongy mesophyll, guard cells, stomata, chloroplasts, photosynthesis, stems, leaves, tubers, tuberous roots, tendrils, apical, lateral, mitosis, growth, wood, auxin, hormone, tropism, phototropism, geotropism. Key terms: xylem, phloem, evaporation, cohesion, adhesion, transpiration, mass flow, diffusion, active transport, translocation, ion exchange, symport, cation, anion, mycelium, boundary layer, sink, source, root, leaves, abscisic acid, stomata, xerophyte, CAM. Life without bees? from David Suzuki’s blog. assessment statement 9.1.3 says explain the relationship between distribution of tissues in the leaf and the functions of these tissues. the answer should be restricted to the following functions: absorbtion of light, gas exchange, support, water conservation, trasport…. what structure helps support the leaf??? the rest of them are understandable, but the study guide doesn’t explain which structure aid’s in supporting the leaf? Good point – the vascular bundles (xylem and phloem) support the leaf, especially when filled with water. 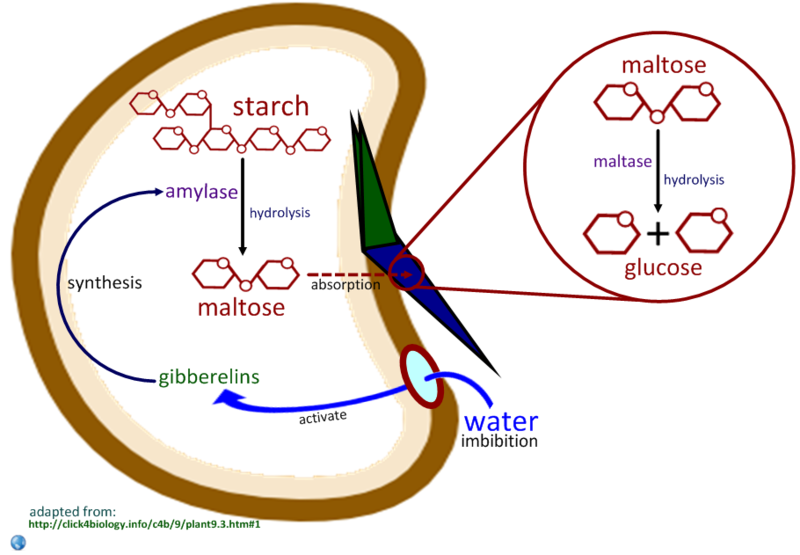 Don’t forget also the structural support role of the cellulose in all cell walls. Last year, did the transport ppt include info on apoplastic and symplastic routes? It’s not in the assessment statements, but I’ve seen it covered in old IB questions. Has it been excluded from expected material at this point? I have not seen any recent IB questions that include it. Thank you again for these amazing study tools! I have not included apoplastic and symplastic in these presentations, as they are not in the subject guide. They might have appeared in past paper questions for the old guide. This website is fantastically useful! Please never take it down or retire. My students think you are a biology god…. PS Leonie says: ich finde die seite super klasse, sie ist echt super nuetzlich!!!! Sie sind ein Biologie Gott und wir sind echt begeistert von ihrer Seite. Thank-you Nick und danke-schön Leonie, Blake, Chazdog Alpha and Louisa!